who’s sacrificed your health for success? Having less energy to keep up with your current schedule? Anxiety and stress because you are aging faster than you’d like? Excess weight that makes you look older than your age? Diminished vitality that makes you lose your professional edge? unable to perform to your highest standards? on top of your own game? Isn’t it time to change the way you’re aging? Enjoying supremely satisfying sleep – night after night. Waking up refreshed and ready for the day ahead. Moving through your work day feeling calm, awake and in control. With increased confidence, because you love they way you look and feel. With lustrous skin and radiant eyes that shine success from inside out. Dependable energy and robust vitality, to support the success of your dreams. Did you know that 80% of age-related illness results from poor diet & lifestyle? Don’t blame your current health on age or genetics. You have the power to change the way you’re aging by shifting the way you’re living. While you can’t turn back the clock, you can reset it. And I can show you how to do this, naturally, without potions or pills. Request a “Younger As You Age” Breakthrough Session, right now! Together, we’ll change your complaints on aging into other people’s compliments of how fabulous you look!! Click on the consultation sign-up page to schedule. I’ll confirm your breakthrough session by email. We can connect by phone, skype or in-person. I look forward to helping you change the way you age, so you can look and feel your fantastic best every day. PS. 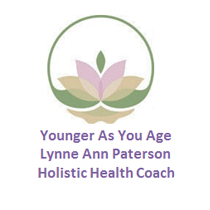 If you love the way you’re aging, please pass my information along to an associate, employee, girlfriend, daughter or any woman you know, who wants to change the way she’s feeling and the way she’s aging. Sign up for a complimentary consultation, today.